Navarra (also known as Navarran, Navarrais, Navarre, Caballo Espanol, or Subraza de Navarra) Ponies are a North Iberian Mountain Pony. They are bred in the Urbasa Nature Reserve. The province of Navarra, between the Pyrenees and the valley of the Ebro, in the region around Pamplona is their homeland. They live semi-wild in small herds. They stand 12 hand to 12.3 hands at the withers. They are generally dark brown without white markings. medium head, straight profile, small ears, mouse, muscular, wide neck, strong, deep body, sloping croup, short coupling, solid legs, hard, round hooves. They are forward moving and sure footed. They have an abundant mane and tail. These ponies are tough, easy keepers and healthy. They are intelligent with a lively temperament. This breed has influenced other breeds such as the Andalusian. 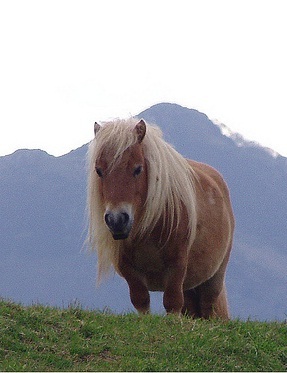 Stallions are used in other regions of Spain to breed small, useful horses. They can be used for riding and carting, as well.